We crossed out of Portugal into Castillo y León and the vast high plateau of the interior. Good farming country no doubt but not very exciting, although less arid here than further south. The plain in Spain is mainly rather … plain! 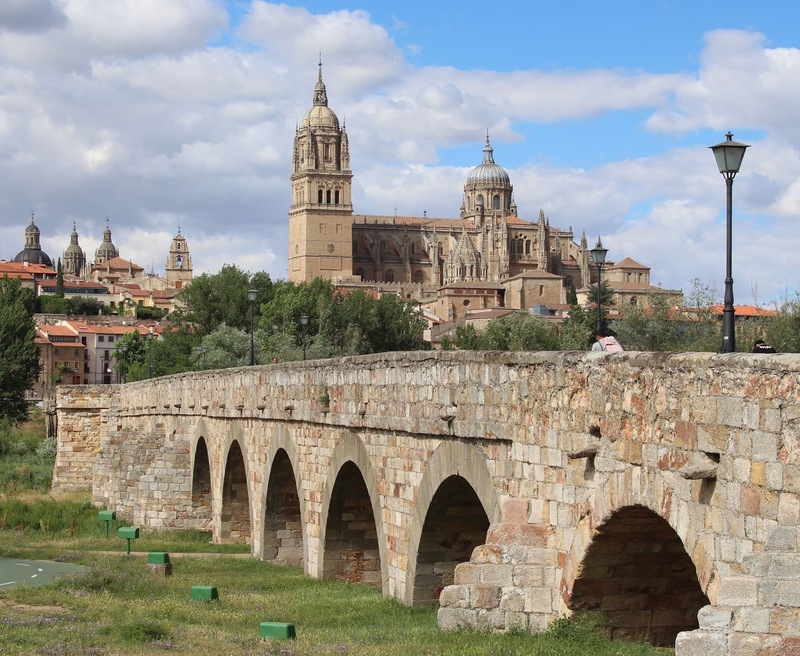 But then we arrived in Salamanca, probably one of the most interesting and beautiful cities of Spain or indeed Europe. Built almost entirely out of a very fine local sandstone that carves well (and preserves in the dry climate) this was one of the four or five great medieval centres of learning in Europe. It still hums with students today, thronging the gothic and baroque buildings of the ancient university. It is a city filled with vast institutions, religious and secular, and all in this honey coloured stone, intricately carved, that gives a unity to the whole city, which well deserves its world heritage status. The defensive walls are still largely in place, and a Roman era bridge spans the wide river and flood plain to the south. There are two cathedrals: the jewel like Romanesque building, retained when they built a new much grander edifice beside it, turning the Catedral Vieja effectively into a vast side chapel. What a beautiful survival from this era, almost a thousand years old, a spare, well proportioned, with simple vaulting and strange animal carvings. We were lucky enough to attend a concert by an American university choir here. The main university building, with soaring spires and a huge baroque portico, almost outguns the cathedral in scale, but the pièce de résistance is the Plaza Mayor, the grandest of grand squares, full of people eating, drinking, cycling, meeting up, having chance encounters and just generally being very Spanish. Lots of groups all just talking at the same time, gesticulating and generally enjoying life. We stayed in a former palace opposite the Convento de San Esteban, yet another magnificent complex. It has a fine transitional church with a huge choir that accommodated over a hundred monks; and a two storey cloister, full of wheeling screaming swallows and nesting storks. It's obvious the Dominicans who built it didn't stint themselves like other orders. This was perhaps the most impressive of many splendours. Our final stop was in León, a smaller city, like a more modest version of Salamanca, with a slightly ramshackle Plaza Mayor, and busy narrow streets in the old town, including some excellent tapas places around the Plaza de San Martin. We sat there on Friday evening as it rapidly filled up with locals, starting their weekend in good spirits. There is a surprising amount of the Roman wall surviving, and a very fine Romanesque basilica, San Isidro. The cathedral has some of the best stained glass in the world, dating back to the 13th century, and there is the magnificent Convento de San Marcos, now a parador, which is where we stayed. Its vast public rooms, a cloister, and riverside terrace make this a great place to stay, although the restaurant was disappointing. But it was beginning to feel like the end, and a good time to return home. We travelled on quiet roads in the foothills of the Picos, past abandoned coal mines, but mostly through lovely countryside, then the narrow gorge that cuts right through the mountains. We stopped off at Potes, a charming mountain village clinging to both sides of a steep valley, then the quick run back into Santander, the ferry, and home.